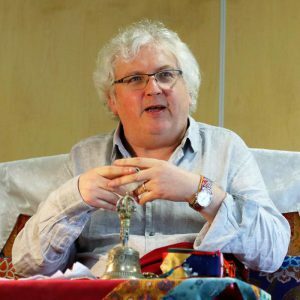 The first teachings of 2018 with Lama Jampa Thaye took place on 13 January hosted by Sakya Buddhist Centre Bristol. 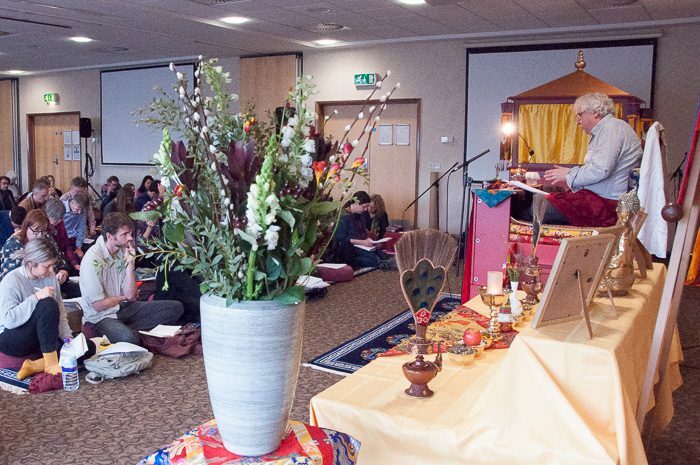 They included a thought-provoking text by Karma Thinley Rinpoche on the meeting of Buddhist and Western cosmology called ‘The Telescope of Faith’. Why this teaching and why now? Buddha was born into a sophisticated, ancient Indian culture 2,500 years ago. In teaching the people of that time, the Buddha drew on contemporary views of the world to help disciples connect with the truths he had realised. In describing the universe, the Buddha relied on the system of cosmology drawn from Hindu mythology, where a huge mountain is encircled by the sun and moon and where eclipses were thought to be caused by the ravenous cosmic dragon, Rahu. With Tibetan Buddhism now reaching far beyond the Land of Snows, the Buddhist master Karma Thinley Rinpoche encountered many young Tibetans in India and the West who had received a modern education, along with its modern depictions of the universe. They asked Rinpoche if they should still believe the traditional Buddhist cosmological description of the world. Rinpoche’s work, ‘The Telescope of Faith’ is his response to this question. 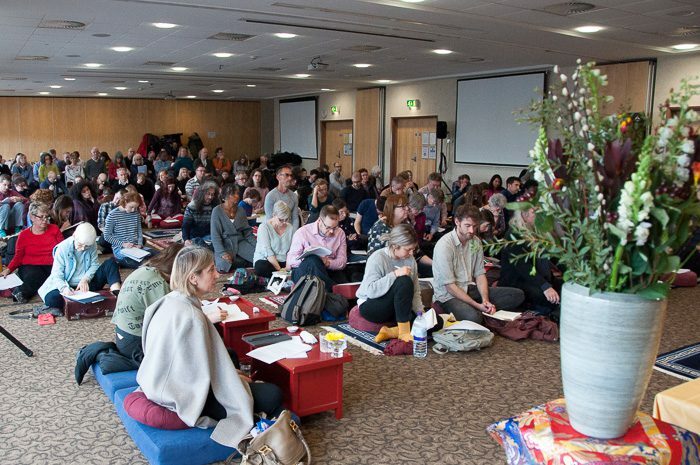 At the Future Inn in the centre of Bristol, around 120 people listened to Lama Jampa Thaye teach the first part of this important text. A key point in the text is that in whatever terms the world is described – ancient or modern – this does not affect how things truly are. We cannot yet experience this and, just as people over two millennia ago, we apprehend things through cultural filters as we see self here and other out there. Whether we have swapped a modern understanding of cosmology for the ancient one, our view is still mistaken and the basis for all the sufferings we experience. How are we then to understand provisional teachings, that is, things the Buddha taught to help meet us at the door of dharma rather than directly describing how things truly are? In Buddhism, provisional teachings are still essential as they lead to us from where we are to the ultimate view of emptiness. Following such a rich morning of teachings, Lama Jampa completed the day with the initiation of Black Manjushri from a very precious cycle of teachings within the Sakya tradition of Tibetan Buddhism known as the 13 Golden Dharmas. The practice of Black Manjushri is renowned for pacifying many different types of obstacles to help practitioners achieve realisation of the true nature of reality, beyond ideas and concepts. A powerful reminder that enlightenment is still within reach. 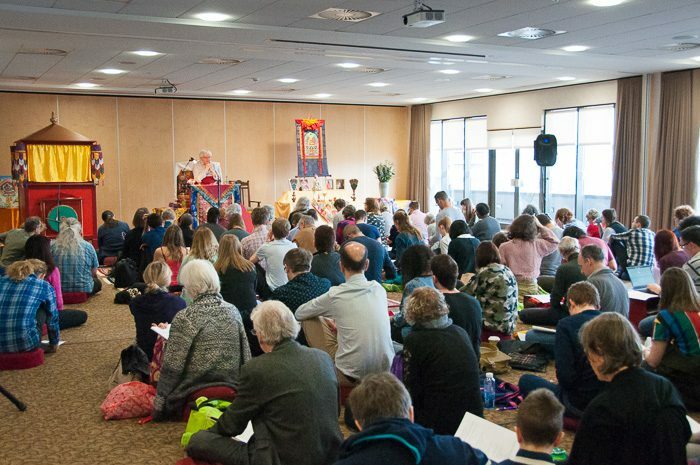 Lama Jampa Thaye will return to Bristol to give part two of the ‘Telescope of Faith’ in June.